Would you like to see the best performance out of your modular sniper rifle that it’s capable of giving you? 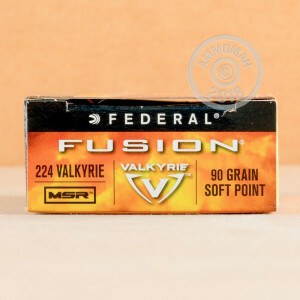 Then this 224 Valkyrie cartridge from Federal’s Fusion MSP line of ammunition is ready to show it to you. Its propellant will deliver a fast 2,700 fps muzzle velocity out of a typical MSR barrel, without creating a potentially harmful chamber pressure. That propellant produces a low flash as well, so you won’t be blinded while firing this round when it’s dark out. 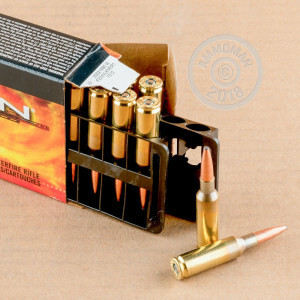 This cartridge features a 90 grain soft point projectile. The core of the bullet is pressure formed to give it exceptional accuracy, and is molecularly fused to its jacket to prevent the two from separating during penetration. Its ability to widen as it passes to deep within a soft target makes this round’s projectile a sure thing for buck hunting. This round’s brass casing is fresh from Federal’s factory, so it cycles like a dream and is fit for reloading. Its non-corrosive primer is also optimized to be struck by a free-floating firing pin.